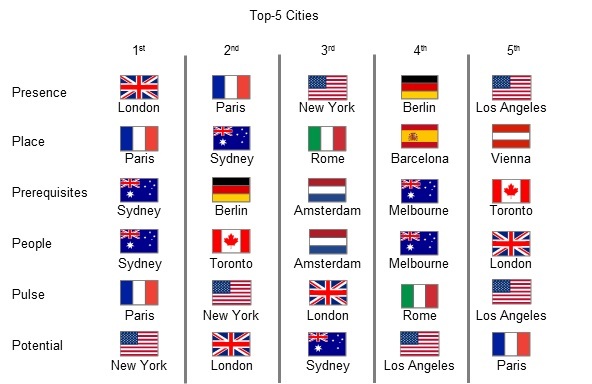 2015 City Brands Index: Fresh off the press, the current edition of the biannual Anholt-Gfk Roper City Brands Index (2015) sees Paris, London and New York City as the three cities with the highest reputation scores, followed by Sydney, Los Angeles, Rome, Berlin, Amsterdam, Melbourne and Washington D.C. The biannual CBISM survey was conducted among citizens in 10 countries – both developed and developing – that play important and diverse roles in the flow of business, cultural, and tourism activities. In all, 5,166 online interviews were conducted with adults age 18 or over. New York, Los Angeles and Washington, D.C. saw their score increase from the 2013 CBISM Study. NYC and LA rose more than two points versus 2013. Washington, D.C. gained less than one point, but still dropped four places due to being outperformed by other cities. “Paris, London and NYC, the top three cities globally, are still struggling to bring their world-class reputations into the specific dimensions of Prerequisites and People,” said, Vadim Volos, GfK’s SVP of Public Affairs and Consulting and leader of the CBI study at GfK. The Anholt-GfK CBISM Index measures the image of 50 cities with respect to Presence, Place, Pre-requisite, People, Pulse and Potential. For the 2015 study, 5166 interviews were conducted in total, consisting of at least 500 interviews in each of Australia, Brazil, China, France, Germany, India, Russia, South Korea, UK and USA. Adults aged 18 or over are interviewed online in each country. Using the most up-to-date online population parameters, the achieved sample in each country has been weighted to reflect key demographic characteristics including age, gender, and education of the online population in that country. Fieldwork was conducted from September 10th to 23rd, 2015. Where may I obtain the full list? I want to see where the cities from China rank on this index. Unfortunately we don’t have the full list, Ramon. Probably best to contact GfK directly. You’ll find contact details on their website. My name is Nikita, pursuing Doctorate in Smart city raking for India. I am planning to develop generic raking system for Indian smart cities. Hi Nikita, please get in touch directly with the publisher of the ranking to see if they can help you. Best of luck with the Doctorate! I am Hasnina from Malaysia. currently i’m doing my PhD in City Branding. I really amazed with the CBI in evaluating city brand. I would like to have a set of questions used in the CBI survey, to study more since i couldn’t find it anywhere in my literature. your attention and cooperation and kindness is really appreciated. Hello Hasnina, unfortunately we don’t have access to this information. Best for you would be to get in touch directly with the publisher of the ranking. All the best for your doctoral studies!